Le Loi is a real person, a revolutionary and king in the 15th century, who began a dynasty that would last 360 years. In 1406, the Chinese Ming emperor ordered an invasion of Annam, the country later named Viet Nam. The invasion succeeded, and the Chinese began their rule over the Annamese people. When the Chinese invaded in 1418, Le Loi was twenty years old. After witnessing a number of rebellious uprisings crushed by the occupying Chinese forces, the young Le Loi gathered his own meager force of 500 people to fight against the great Chinese Ming army. The revolution lasted ten years. Le Loi went from one defeat to another, but every time his forces were pushed back, he'd return with an even larger group of patriots to fight. One man who fought side by side with Le Loi from the beginning was Le Lai. In one famous battle, the Chinese had Le Loi's army surrounded on a mountaintop. In an effort to break the siege, Le Lai dressed himself in Le Loi's armor, leading a small band of fighters to face the Ming army head on. Le Lai was captured, but the maneuver was just the distraction to allow Le Loi to escape. In recognition of Le Lai's act of ultimate loyalty and friendship, Le Loi ordered that all his descendants worship Le Lai as an ancestor, and that they would always conduct memorial services for Le Lai one day before services for Le Loi. Eventually Le Loi's revolt succeeded, liberating Annam from foreign rule. For hundreds of years Vietnam was free, until the French colonization in the 19th century. Great deeds beget great legends. Popular beliefs hold that Le Loi was endowed with a magical sword, given to him by a Golden Turtle God. 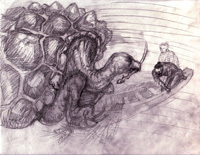 Unlike Chinese folklore that hold turtles in low esteem, the Golden Turtle God makes several appearances in Vietnamese traditions. The legend has many versions. According to one, a fisherman caught a sword blade and sold it to Le Loi. The sword was inscribed with the words "Thuan Thien," meaning "according to heaven's will." Le Loi later found a handle that fit the blade perfectly. The discovery inspired Le Loi to gather up men to fight the Chinese. When the country was liberated, Le Loi crowned himself king and settled in what is now the capitol of Vietnam, Ha Noi. One day, as King Le Loi was taking a leisure boat trip on a lake in the capital, the Golden Turtle God appeared from the lake. Le Loi drew his sword, but it magically slipped out of his grip, flew to the Golden Turtle God who caught it, nodded to the king, and dove away. After that, King Le Loi ordered the lake renamed Hoan Kiem, or "Returned Sword." The lake is still in the center of Ha Noi, and ancient turtles estimated to be hundreds of years old still live in it. 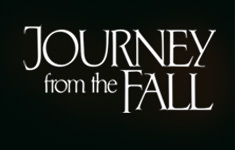 In Journey From The Fall, the legend of Le Loi is re-told by Ba Noi to her grandson, Lai. And like all grandmothers, Ba Noi takes artistic liberties with the orthodox version. Legends live through the imaginations of ordinary people, told in various tongues in an effort to hold onto the morals and lessons from a fading history. Such is vox populi.